This #gratitudefriday, we are celebrating fall and feeling grateful for root veggies! We love creating recipes that incorporate fresh vegetables, and we especially love sourcing our veggies from our local farmers who work hard to cultivate and harvest them. As we shift into fall weather, root veggies have started popping up at our farmer’s market and we’ll be making lots of yummy recipes with them in the coming weeks! Root veggies are packed full of nutrients. They’re loaded with vitamins A, B, and C, which support the immune system by reducing inflammation throughout the body, and help fight conditions like chronic illness and heart disease. Combined with the possible anti-inflammatory benefits of CBD, root veggies will help your body stay healthy and happy — which is extra important when autumn colds start getting passed around! 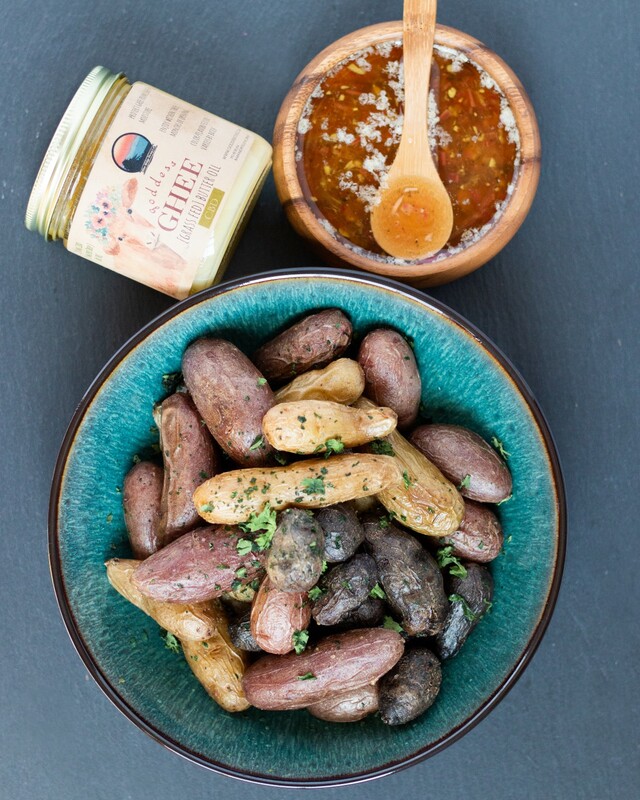 These roasted fingerling potatoes are made extra savory with a buttery, @cbdsuperfood x @goddess.ghee dressing. Check out the recipe below, and make this delicious side dish in your own home! Preheat oven to 400˚. Roast potatoes in a casserole dish for about 20–25 minutes. Heat a saucepan on the stove. Remove from heat and place ghee in saucepan to melt. Stir in remaining ingredients. When potatoes are fully cooked, top with dressing or serve on the side.